Asian messaging apps are both popular and profitable, why shouldn't Facebook and Google do the same? While peer-to-peer messaging on a mobile phone has always been the most basic of all mobile phone features, 2016 is shaping up to be the biggest year ever in the transformation of smartphone messaging into more than just a medium for communication. Putting aside the continued breakout growth of Snapchat and Whatsapp, there’s quite a bit happening with the world’s two leading message apps: Facebook’s Messenger and Google’s Hangouts eventually to be remade into Allo. Earlier this year, Facebook opened up their Messenger app for developers to build in-app bots that could do anything from receive news to ordering food. Google followed shortly by announcing Allo a brand new messaging app that will also have similar bot capabilities. The plainly obvious goal of Facebook and Google in encouraging developers to build bots directly into messaging apps is to acquire more users for their messaging apps. Increased usage of the messaging apps and a larger user base leads to top line revenue growth for their advertising-driven business models. Even though developers have already enthusiastically gravitated towards Facebook’s bot features with tens of thousands of apps currently available, Facebook (and eventually Google) may be ignoring the greatest opportunity to extract value from their apps. 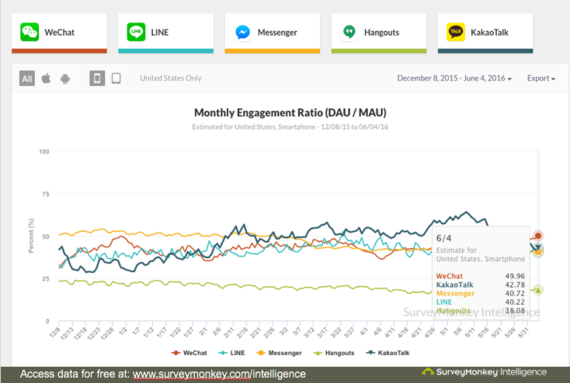 To view the true engagement potential of a messenger app can be, just have a look across the Pacific Ocean to the leading apps of Asia. 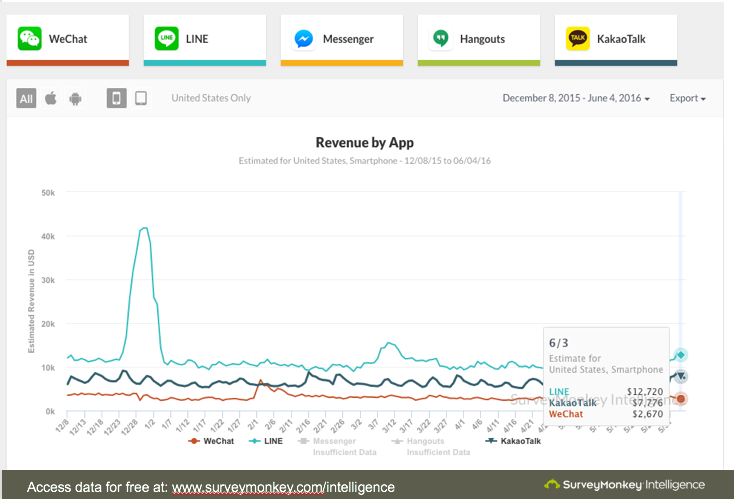 The major Asian messaging apps of WeChat, QQ, Line, and Kakao Talk are not just growing their user base but they are even able to generate in-app revenue in tandem with that growth. Rather than encourage only developers to build onto their platform, the Asian companies build their own engaging and profitable add-ons by themselves. 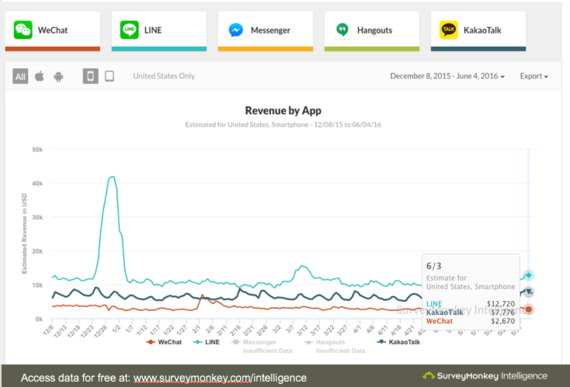 The user base for these Asian apps are not just limited to Asia as according to estimates by SurveyMonkey Intelligence based on a panel of smartphone users, downloads are growing in the US too. While their current penetration pales in comparison to Hangouts and Messenger, the growth trajectory is heading in the right direction. As a result of the features beyond messaging built into the apps, the engagement for these Asian apps are even higher than their US counterparts. 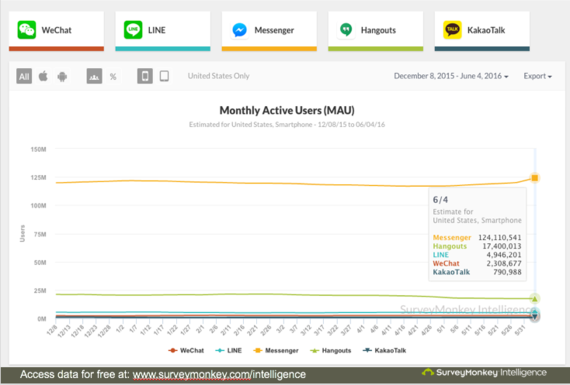 The graph below shows the percentage of the apps users that opened the app on a daily basis. However, the real value in their engagement is their revenue which the Asian apps are actually earning from their apps while Messenger and Hangouts do not. In the US these apps primarily drive revenue from the sale of stickers and enhanced messages with additional pictures; however, in Asia, they do many interesting things which I will go through one by one. Tencent also owns another messaging app called QQ which was originally a desktop app, but has now migrated to mobile and is available in English. QQ has 829 million monthly active users and monetizes by selling games. The most interesting feature of QQ is that it has a live translation option to allow people who don’t speak the same language to converse. Line is owned by the Korean company NHN which also owns the most used search engine in Korea. Line was created after the Tohoku tsunami in Japan as a way for people to communicate without straining the calling networks, but it struck a nerve and people loved it. Line monetizes by selling stickers and games to its users. 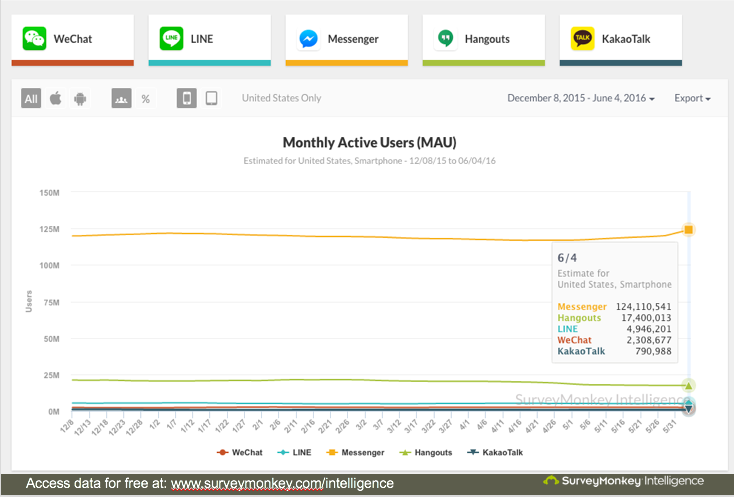 KakaoTalk owned by Daum, the operator of the other major search engine in Korea, currently has 93% of the Korean messenger market. 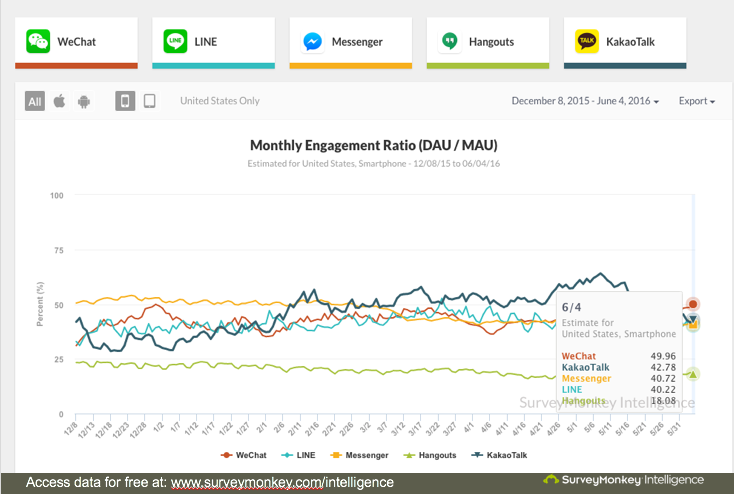 While KakaoTalk began as a simple messaging app it has grown into a platform for games and apps. KakakoTalk monetizes by selling its users stickers and even consumer goods like Starbucks coffee gift cards. While the Asian apps take an all of the above approaches by building out platforms as well as API’s it’s possible that Google and Facebook will eventually go down that route too. There is no doubt that chat bots will pull current and future users even deeper into the usage of Facebook Messenger and Google Hangouts (and eventually Allo), but should they stop at just bots? Messaging apps have the ability to be everything that happens between multiple parties on smartphones even to the extent of becoming their own operating system. With the Asian apps as the model, Google and Facebook could be leaving money on the table if they continue outsourcing the most profitable potential features to external developers to build and monetize.